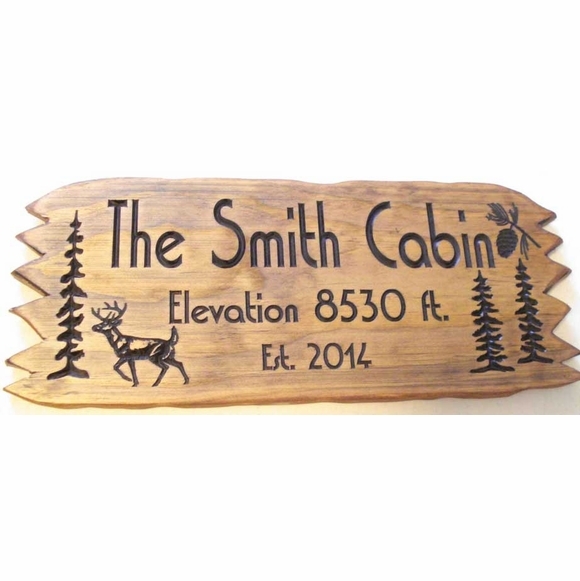 Rustic Cabin Wooden Sign with Sawtooth Edges - - wilderness theme personalized cabin plaque includes deer, pine tree, and pine cone accents. Distinctive jagged edges complete the rustic lifestyle design. Made in USA. Finish: black with medium brown stain. Text and accents are painted black and the overall wood grain is highlighted and captured with a medium brown stain. Four sizes: 18"W x 7"H x 3/4"; 22"W x 9"H x 3/4"; 24"W x 11"H x 3/4"; 36"W x 11"H x 3/4". Line 1 holds up to fifteen (15) 2" characters. Line 2 holds up to eighteen (18) 1" characters. Line 3 holds up to ten (10) 0.75" characters. Line 1 holds up to fifteen (15) 2.5" characters. Line 2 holds up to eighteen (18) 1.25" characters. Line 3 holds up to ten (10) 1" characters. Line 1 holds up to fifteen (15) 3" characters. Line 2 holds up to eighteen (18) 1.5" characters. Line 1 holds up to fifteen (15) 3.5" characters. Line 2 holds up to eighteen (18) 1.75" characters. Line 3 holds up to ten (10) 1.5" characters. The sign arrived within the time frame specified. It was well packaged and undamaged. The workmanship on the sign is excellent. I ordered a personalized Rustic Cabin Wooden Sign with Sawtooth Edges and it came out beautiful. The picture on the site is good, but the actual finished product is phenomenal. Love it, and it was personalized, shipped and received within 9 days!